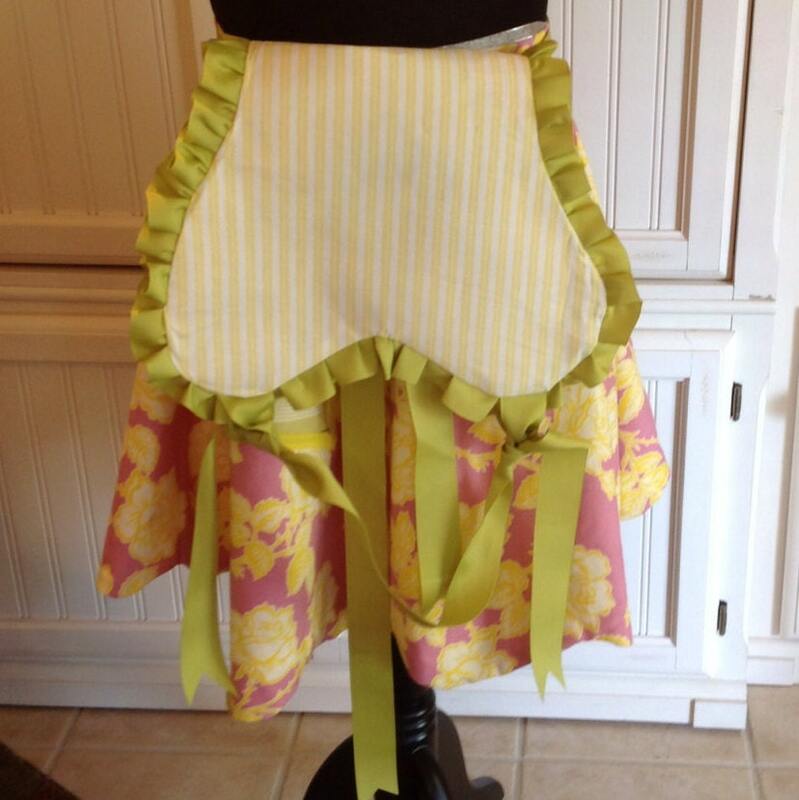 This bright yellow roses on pink background with chevron striped green, yellow, and pink bib full apron reverses to a cheery yellow pinstripe. 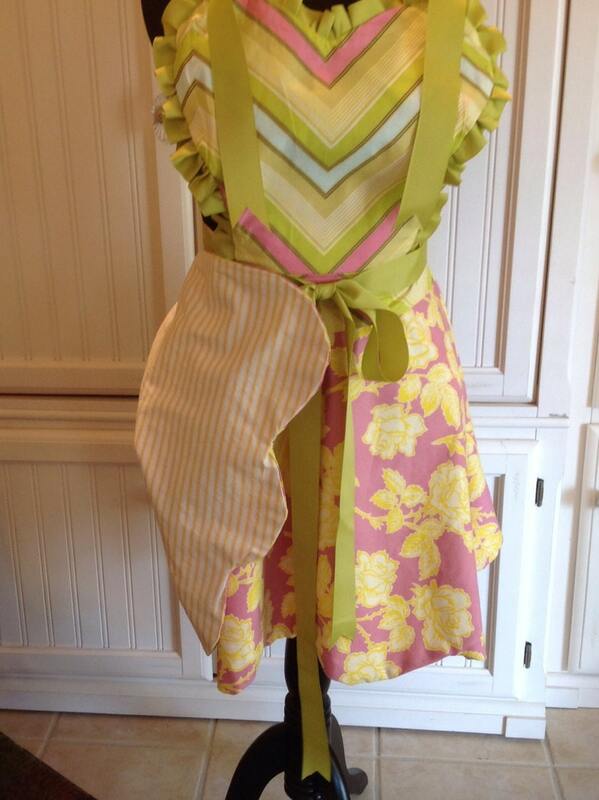 There is a special green ruffled ribbon trimmed pocket on one side and a yellow bias taped pocket on the other side. 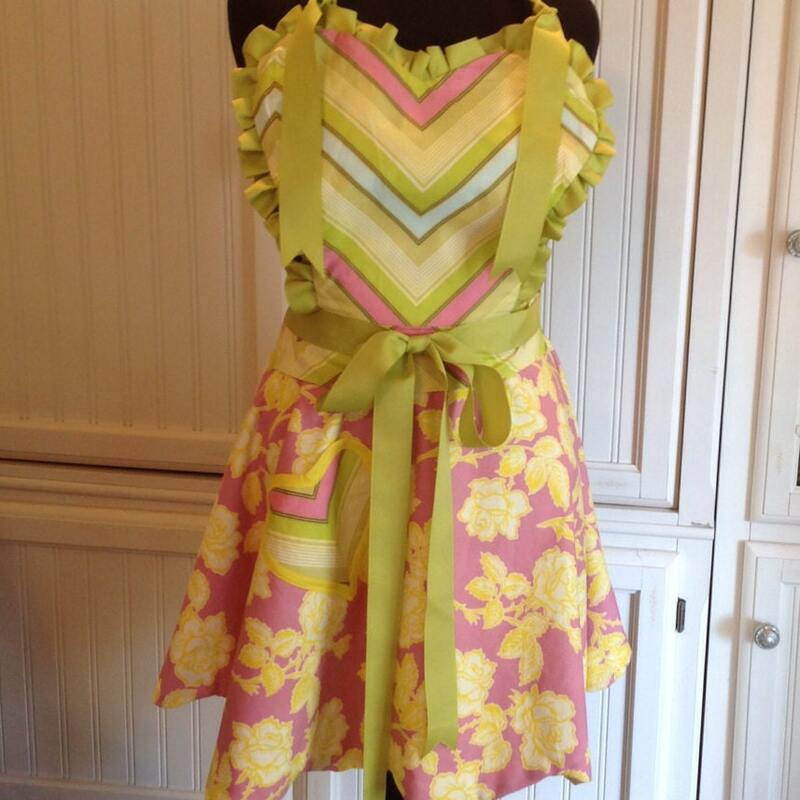 The sweetheart neckline is trimmed with a green grosgrain ribbon ruffle. The sweetheart bib is detachable so you can wear the apron alone or simply use the ribbon ties and attach the bib for a more "dressy" look. 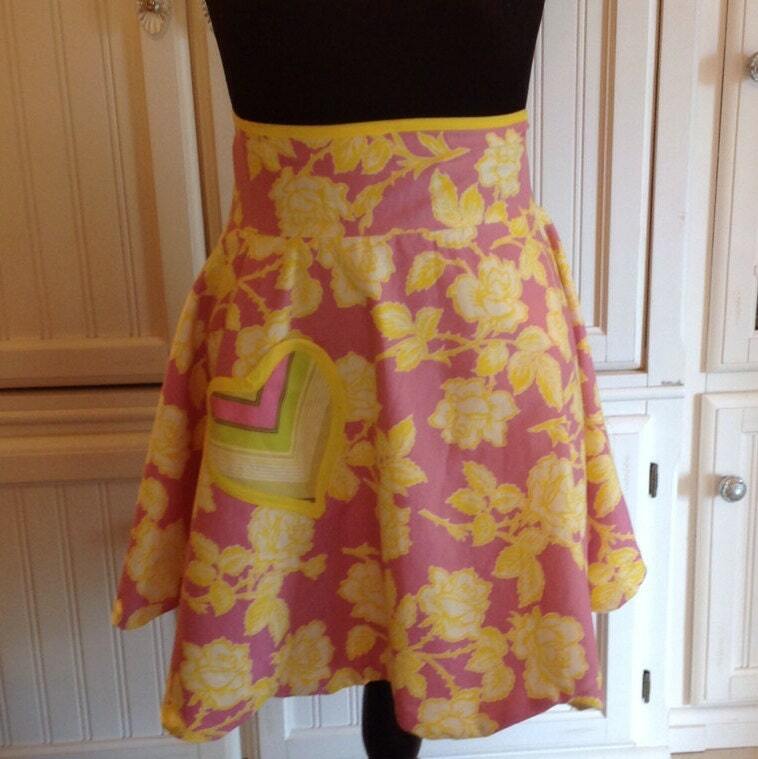 The apron waistband is extra wide and trimmed with yellow bias binding. The grosgrain ribbon ties on the bib are extra long so that you can wrap it around your waist and tie a full bow in front. 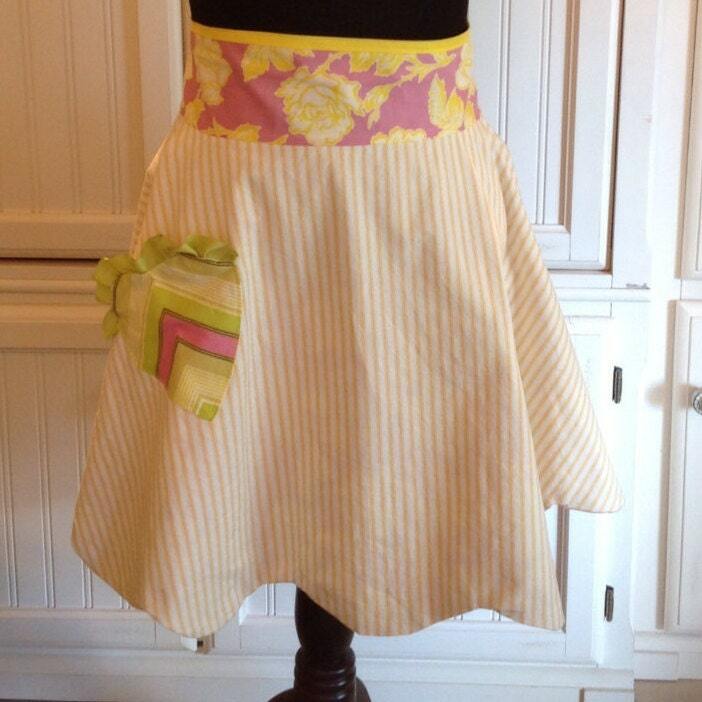 All material is pre-washed and both apron and bib are washable cotton. Payments are expected at time of purchase. I do not begin work on custom orders until after payment is received. My shop is located in Harris County Texas, so if you live in Texas expect to pay sales tax on your purchase. I ship every day so if you order in the morning it will likely go out that day. Afternoons and weekends shipping is next business day. Custom orders are shipped within 2-5 days after payment is received unless otherwise indicated in the order approval process. All sales are final unless the item you receive is damaged . If that should happen please convo me immediately so that I can make things right. If you are unhappy with the item you received please contact me so we can discuss and find a solution.